Hindsight is a wonderful thing. Looking back at our rescue, it was all so easy and so stress-free, but of course, it wasn’t at the time. Picture this. You have just spent a few thousand kuai at Hongqiao toy store with two hot, sticky and hungry kids aged 5 and 7 and you are already panicking about the argument you’re going to have with your husband over this. It is a hundred and seventy degrees outside and you are loaded with four bursting bags, craning your neck (which is plastered with hair and sweat) for a cab, simultaneously trying to grip two very slippery little hands on the ends of two very diva-like bodies. “It’s too hot, mum!” these bodies wail as you struggle to keep a raging heat headache from rupturing the confines of your skull. Oh, and you also forgot to eat breakfast so your stomach feels like the black pit of despair. In the misty heat, you try to project yourself to the air-conditioned future, but it all seems too far away to contemplate effectively. Cab after cab sails by, windows tightly encasing cool, calm, collected air and happily smiling passengers. Then suddenly, a parking attendant materialises by your side and he smiles a lopsided grin and he gets busy with it on that jam-packed road and from the fluxing waves of heat rising off hot metal taxis, a cab slides towards you out of magical nowhere and slips to a stop and the attendant is opening the door and inside there is nothing but cool air and a lovely young cabbie. You slide those kids into that cool, gasping so hard you might just have run a 10k marathon. “Qu nar?” he says and it’s the sweetest thing you’ve heard all day (other than the price of the Nintendo DS you just bought for a song – I only make occasional trips to Hongqiao so am already buying Christmas presents, FYI). “To my freezer in the sky,” you say with a relieved smile. “Hao le!” and you are zooming off towards home. Things go well until you hit the second ring road. But so long as things are icy, it doesn’t bother you to sit in traffic all day if you had to. The kids have their toys, you are just happy to be cool and for the rugrats to be occupied. And anyway, you have Mickey Mouse lollipops in case of emergency. Clever you. Nonetheless, after twenty minutes in almost standstill traffic, you feel a surge of relief when the traffic starts to flow again. Heading north along the second ring, cars are zooming now and all is ok, but you should have taken a cue from the bumpety bump of the car engine about a kilometre back. “He’s just out of gear,” you thought to yourself at the time. So when the cab’s power suddenly fades on a nice long stretch of road, it’s not the imminent breakdown that initially worries you. It’s the toxic white plumes of smoke billowing from the air-conditioning vents and into the cabin that really send you into a frenzy. “Stop the car!” you scream the obvious, and seconds later, you are hauling two kids and four massive bags out onto the second ring road in the burning heat with cars zooming past you and you are in the centre lane! “Oh dear Lord send a miracle fast,” you whimper as you scream at your 7-year-old to stand completely frozen against the other side of the taxi, while you grip at your 5-year-old in terror and the horrified cab driver runs around flapping his arms like an elegant crane, unsure of what to do, but then most beautifully thinks to himself “stuff the car engine” and proceeds to protect your kids from the traffic. Truly – these dire moments seem to take forever. It is probably only less than a minute that this drama unfurls itself on the stinking hot, precarious second ring road, but it seems like hours and hours of drastic mental processing – “How are we going to get out of this??! !” – and eyeballing for a vacant taxi (there aren’t any) before an answer presents itself in the form of a black 4WD and two smiling Chinese faces in the windscreen. It is the fellows who were travelling behind you and got hemmed in by the zooming lanes either side. The driver winds down the window “Get in!” he calls, “We’ll take you home!” Tears spring to your eyes and you bustle into the back seat. The fellows smile and ask where you’re from and where you’re going. Then they flip on the air-conditioner and direct the vents towards you. Then they make more chitchat to make you feel as comfortable as anyone could feel in such a situation, then they drop you twenty metres from your house and they drive off into the pollution-clogged distance and you realise you have just been the recipient of a lovely act of kindness. 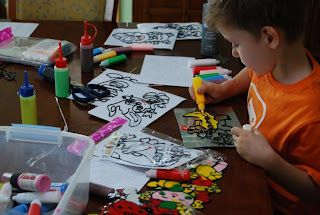 Footnote: My kids are sitting at the dining table doing squeezy paints, one of their most favourite things to do – and, like most things in life, made all the more special by the journey it took to get them. First published on the City Weekend Beijing website.